90 days Warranty...... The Toshiba Excite 10 AT305-T16 PDA08U-001001 Tablet suits the digital needs of today's fast-paced lifestyles. 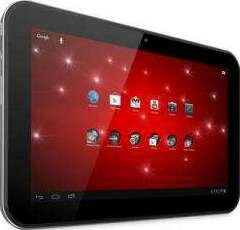 Run by Android 4.0 Ice Cream Sandwich, the Toshiba Excite 10 AT305-T16 PDA08U-001001 Tablet grants access to thousands of downloadable Android apps available in Google Play. Moreover, this amazing tablet is powered by NVIDIA Tegra 3 CPU with 1GB memory that delivers enhanced mobile computing, giving you a seamless access to the digital world. We offer express delivery to Dubai, Abu Dhabi, Al Ain, Sharjah, Ajman, Ras Al Khaimah, Fujairah, Umm Al Quwain, UAE for Toshiba 10. We offer the best price for Toshiba 10 in Dubai, UAE. Buy now with the best price!